Sliding and folding doors have become the product of choice for architects and designers around the world. A perfect way to transform a view into a truly panoramic vista, bi-fold doors move aside effortlessly to provide a wide open space. They are suitable for a wide range of uses, from shop fronts and restaurants to private homes, and in many instances can be incorporated into conservatories. Most of the designs are suitable for internal as well as external use. The custom construction means that the system has no fixed panels, mullions or posts, yet when closed, the doors are secure and capable of withstanding even the most severe weather. 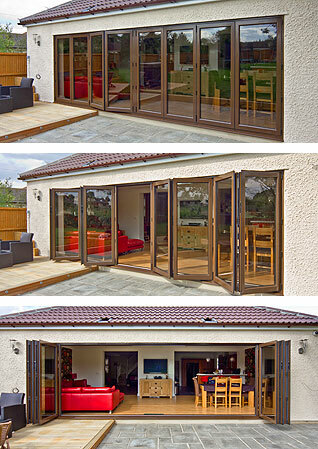 We can supply and install sliding bi-fold doors constructed from solid timber or from composite materials. All are built to the highest possible standards, and will ensure a robust, lasting and beautiful product to truly enhance your home. All our timber folding, sliding and bi-fold doors are supplied with the option of bare timber, or factory paint or stain finishes. Paint and stain finishes make use of micro-porous sealants, primers and top coats and there is an almost unlimited choice of colours. This finish provides long-lasting weather protection and elasticity, eliminating the risk of distortion that can occur with other products. Composite bi-fold doors are available in a massive choice of colours and wood-effect surfaces and use construction methods that make them virtually indistinguishable from timber products, and they are effectively maintenance free. Timber and composite doors all carry full guarantees.